This is so easy. I will start the day off with coffee and either generous serving of berries or now, because it’s summer, MELON! Lovely melons are so filling because of their high water content, which certainly helps me stave off hunger. I love watermelon because it is rich in potassium, which helps retain calcium in your body, and it’s also super tasty! Cantaloupes are high in vitamin C and also a “meatier” fruit, which really helps fill me up in the morning. I will usually follow my fresh fruit breakfast a few hours later with some organic oatmeal or sprouted toast with almond butter for a mid morning pick me up. Smoothies have been known to make an appearance as well! Pour one tablespoon of olive oil in a pot, place on your burner over medium/low, throw in your chopped garlic, and let it simmer for 2-5 minutes. Pour in your bulgur, dry lentils, basil, parsley, oregano, and paprika. Coat the bulgur and the lentils in the oil, spices, and garlic for about 1 minute. Pour in the 3 cups of low sodium broth, stir your mixture, and hike the heat on your burner up to high. Once boiling, reduce heat to a simmer (low), cover your pot and let it sit for 15 minutes. Turn off the heat after 15 minutes, but if it still looks a little watery, cook for several more minutes. Not every pot is created equal! Let sit for 5 minutes with the top on. Do not peek! While waiting for 5 minutes, dice your red onion and your kalamata olives. After 5 minutes is up, mix up your delish bulgur/lentil masterpiece, and spoon out onto a plate and cover with a handful of arugula. Top each plate with red onion, a few kalamata olives, and diced red onion. Drizzle each plate with about 1 tablespoon olive oil and 1 tablespoon balsamic for an extra kick, add salt and pepper to your liking…and VOILA! Hi, my name is Kathryne and I like EASY and QUICK recipes that are HEALTHY and also FUN! Can you relate? If so, then you will LOVE these quick and easy eggplant patties. I ate them as is with a knife and fork, but it you wanted to, you could totally throw these on a bun with mustard, tomato, lettuce, and a pickle and have yourself a yummy eggplant BURGER! Cut your eggplant into ½ inch thick circles. Put them on a plate. Sprinkle a little salt (just a dash) on them to draw their water out (to avoid soggy burgers). Let them sit in the salt for 5 minutes. Whisk together your olive oil, balsamic, and pepper. Transfer your eggplant to a mixing bowl. Pour your balsamic mix on the eggplant and let it sit for 3-5 minutes, coating both sides. I used a George Foreman Grill and did the criss cross design on mine… these can totally be done on an outside grill too! The cooking time on an outside grill will be less, so if you choose to go that rout, just watch ‘em! I cooked my eggplant for 4 minutes, then flipped them to get that criss crossed design for another 4 minutes. Next time I do this (oh, and I will!) I want to try it on the charcoal grill! It’s finally SUMMAH TIME! A great side, or full meal, depending on how many people you’re feeding. I ate this all by myself as a dinner one night and was quite satisfied! Wash your asparagus and pat dry with a paper towel. Coat your skillet with coconut oil and on medium heat as it melts, swirl it around, adding your chopped garlic. Let the garlic sweat for 2 minutes while you cut the bottom end of your asparagus bunch off. Throw the asparagus in the pan, coating it with the coconut oil. Throw in your thyme, basil flakes and pepper to *your taste* (I personally can’t get enough thyme) and saute for 5 minutes on one side, and then 5 minutes on the other side, flipping the asparagus with tongs. Pierce the flesh of one stalk to see if it goes in easily. Your cooking times may vary depending on how thick or thin the asparagus is. Squeeze half of a lemon on this beauteous green veggie when it’s done and then serve immediately! Chop up your vegetables accordingly to get them into proper form for skewering. I like to make them boxy! The mushrooms can just go on whole. Take your chopped veggies and throw them in a bowl. With a whisk or a fork, furiously mix together your olive oil, apple cider vinegar, salt, pepper, and garlic powder. Once mixed, pour it over your bowl of veggies, coating all of them evenly. Let this sit for 30 minutes in the fridge. Wash your rosemary stalk thoroughly, and if you don’t want to use the rosemary stalks, you can use classic wooden kabobs, or metal ones, depending on what you own. Whatever floats your boat! 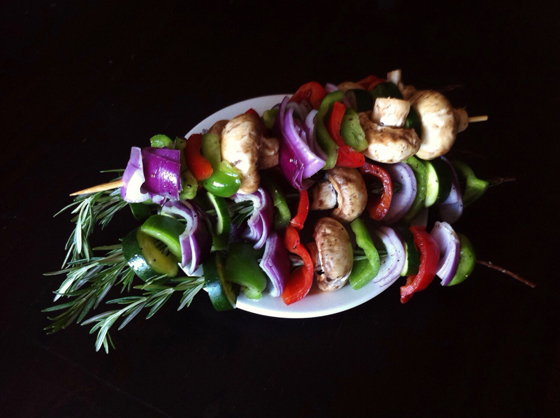 Pierce your veggies, alternating them over and over to fill the rosemary stalk/wooden kabob. It will look really pretty! Set them on a plate and if you have a grill, go for it! I barbequed mine on low heat on the charcoal grill after it had been lit for awhile, and cooked them to perfection, for about 4 minutes on each side. You can also do these in your oven, setting your oven to 450 degrees, and placing the kabobs on a baking sheet. Bake for 10 minutes and a delicious, fun, and SUMMERY meal awaits you! What’s been your experience eating vegan? What are your favorite recipes? These all sound so amazing – I want to make the coconut asparagus for dinner now… It’s awesome how good you feel after going vegan for such a short while, and it’s so good to know that it isn’t too difficult to do! Great post! It seriously is one of my favorites- I just made it again recently, and it’s such an easy summer meal! Quick too! Thanks for reading, I was shocked at how easy it was for me to transition to vegan. Now that the 30 days are up, I am eating cage free eggs again, but no “meat” or cheese. All vegan, plus eggs. So. :0) I am happy, good learning experience!